The Maoists' joining of the multi-party government in Nepal is a landmark event in the country's decades-long struggle for stable and sustainable democracy. Prime Minister Girija Prasad Koirala told the parliament a new chapter had begun in the history of Nepal. He cannot have said a truer word, but every new political chapter in Nepal in the past has been fraught with problems and the new chapter that began on Sunday is unlikely to be different. The Maoists' 10-year journey from the jungle to the government was partly a result of compulsion and partly political wisdom. After 10 years of fighting, the loss of 13,000 lives and massive damage to the country's infrastructure and economy, they were still unable to capture even a district headquarters, let alone the power in the centre. They had also faced severe domestic and international pressure to give up arms and were labelled as terrorists rather than a political party by many, including the United States. At the same time the then rebels had begun to acknowledge that political settlement was the only option for them. Their primary demands were: an all-party conference, formation of the interim government and holding of a Constituent Assembly election to draft the new constitution. 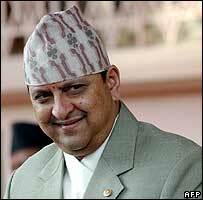 There had been no agreement on those issues until King Gyanendra snatched power from the political parties in 2005. The King's action helped unite the Maoists and the parties, who in principle agreed to the Maoists' demands. The two sides then signed a peace deal. That unity culminated in a nationwide demonstration last April, when the King was forced to hand back power to political parties. The Maoists then agreed to lock up arms under UN supervision and analysts believe it is very unlikely that those arms would be raised again. The current formation of the interim government is the penultimate step of the peace deal which will end with the Constituent Assembly election due on June 20 to draft a new constitution. It is the proposed election that has been the trickiest bit in the whole peace process. The first question is, whether the election will be held in time or not. Only two-and-a-half months are left to prepare. And almost all deadlines agreed by the political parties so far have been missed. There are also sceptics who believe the election may not happen at all due to the politically sensitive issues involved. On top of such issues is the country's 240-year-old institution of monarchy. 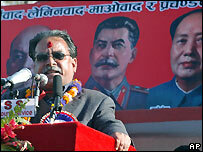 The Maoists believe people will vote for a republican Nepal in the election. The country's second largest party, the Nepal Communist Party (United Marxist Leninist), has already decided to fight the election on the republican platform. Other smaller communist parties will follow the same path. However, the largest party with the most significant political clout, the Nepali Congress, has still remained ambivalent on the issue of monarchy. The path it chooses is likely to have a tremendous impact on the monarchy's future. The handling of the 2005 royal takeover appears to have damaged its image to almost an irreparable state. However, there is growing concern in some sectors that the total disappearance of monarchy in Nepal where political institutions are still weak could deepen the country's woes. Abolition of monarchy is also likely to lead to a federal set-up in the country as demanded by Maoists and many other groups. Given the recent emergence of new ethnic and regional tensions, which have already claimed dozens of lives, critics say the transition to the republican set-up at this stage could be going too far too early. It is undoubtedly the institution of monarchy which has lost out badly in the present political equation. The King exists but in name. His responsibilities as the head of the state have been transferred to the prime minister. "His Majesty's Government" has been changed to "Nepal Government". His pictures are being removed from currencies and his title as the Supreme Commander in Chief of the Army has also been dropped. He has been virtually confined to the royal palace. However, many believe he still wields considerable influence within the army, which they say, has remained loyal to the King. Others point out that the army in Nepal has always backed the "powerful" rather than the "powerless" hence it may hesitate to support the politically weak King if it comes to the point of his removal. The army's role in the coming days will be important, so will be the role of India, which has consistently played a crucial role in Nepal's politics. India long advocated constitutional monarchy and multi-party democracy in Nepal. However, in recent years it has maintained neutrality on the issue of monarchy. As it stands, the monarchy seems to be completely sidelined but ironically it is around this institution the entire Nepali political world is revolving. And it will be the absence or presence of this institution which will determine the future political course of Nepal.